Earlier this week, I assembled a partial list of zombie metaphors. Three more have come to my attention since then: zombie funds, zombie statistics and zombie fleets. Vampire metaphors don’t seem quite as common, but I’ve found a few. In addition to vampire squids (discussed in Jim’s last post), we also have vampire cable boxes and the vampire state. And based on these few data points, I’m ready to make a generalization. 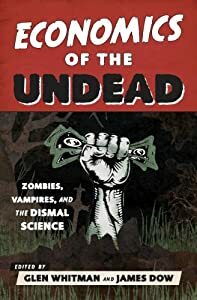 Even though both zombies and vampires have risen from the dead and are hard to kill, and both zombies and vampires feed on humans, when it comes to metaphors there’s a segregation at work. Zombie metaphors almost exclusively reference the risen-from-the-dead or hard-to-kill quality, whereas vampire metaphors almost exclusively reference the feeding-upon-us aspect. Why the difference? The focus on feeding by vampires is a bit easier to explain, because the vampire metaphors highlight not just the feeding, but also its parasitic quality — that is, the tendency to drain energy without killing the host. For example, the vampire cable box doesn’t kill you or your household; it just drives up your electricity bill. Zombies, on the other hand, kill and/or convert anyone they feed upon, which makes them less useful for parasite comparisons. As for why zombie metaphors focus on the risen-from-the-dead quality, I suspect it’s because zombie horror emphasizes how they keep on coming no matter what you do — despite the fact that both zombies and vampires can be exceedingly difficult to dispatch permanently. This entry was posted on Saturday, July 5th, 2014 at 3:08 pm	and posted in Uncategorized. You can follow any responses to this entry through the RSS 2.0 feed.